Don't fight winter weather alone. 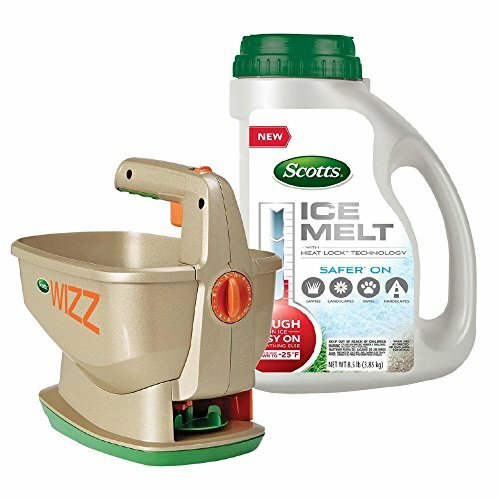 The Scotts Wizz Spreader and Scotts Ice Melt with Heat-Lock Technology are your secret winter weapons. The Wizz is a battery-powered broadcast spreader with exclusive EdgeGuard and Handy-Lock technologies to spread ice melt with ease. Scotts Ice Melt can penetrate ice, down to -25° F and has 4X the melting capacity of rock salt so you use less to get the job done. Plus, it's safer on lawns, landscapes, paws and hardscapes when used as directed. See product label for details. The moisture-activated ice melt heats up to quickly penetrate ice, even at -25° F. Plus, the Heat Lock Technology coating protects hands and paws during application. This season, fight back against winter with Scotts Ice Melt. For best results, apply preventatively before or soon after snowfall begins, to prevent excessive ice buildup. Scotts wizz hand-held spreader Battery-powered broadcast spreader with exclusive edgeguard and handy-lock technologies Covers up to 2,500 sq. ft. If you have any questions about this product by AmzHero, contact us by completing and submitting the form below. If you are looking for a specif part number, please include it with your message.